We’re back after a short break so let’s to find out more about the players that wear the colours for the sport in this country so we set them 12 questions (2+10 for those whose numbers aren’t their strong point) to learn about the characters we have. 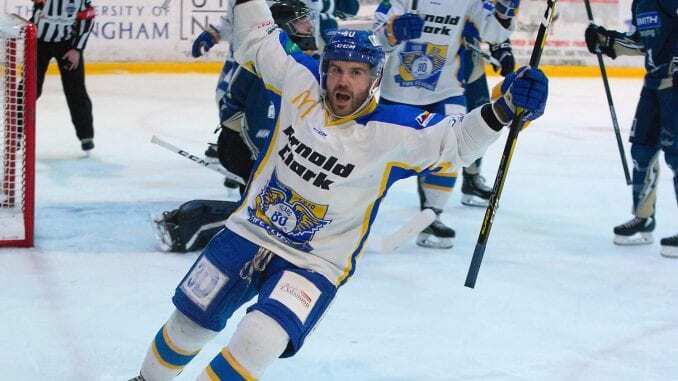 This week, Fife Flyers forward Carlo Finucci manages to shoe horn Tiger Woods, being on national TV and the football World Cup in 2026 as he took the 2+10 test. Read on to find out more. 1) If you were the coach and money was no object, which player would you bring in and why? I would bring in Alexander Ovechkin. He’s a world class player and it looks like he would be fun to celebrate a championship with. 2) Which sporting event, other than Game Seven of a Stanley Cup Final and anywhere in the world, would you most like to see? I would do anything to be in the stadium for a World Cup Final match, preferably with Italy as finalist). Canada, USA & Mexico hosting the World Cup in 2026 might be my best chance. 3) Which sport, other than ice hockey, do you enjoy on TV? I really enjoy watching football it’s my favourite sport besides hockey. I follow the Italian Serie A and Inter Milan quite closely as well as the other major European leagues. 4) If you were stuck on a desert island and you had one DVD or Boxset you could watch, what would it be? It would have to be the Entourage boxset. It’s the first series I got into and watched religiously. 5) If there was fire at your home and all your family and pets were safe, what one item would you rush back in to save? My Pavel Buré autographed game worn Vancouver Canucks jersey. 6) If you hosted a chat show, which three guests would be at the top of your list? Pavel Buré, Francesco Totti and Tiger Woods. My hockey idol growing up, a footballing legend and greatest golfer of all time and he might be able to give me a couple tips for my game. 7) Who would play you in a movie of your life and who would be your leading lady? 8) If you had to choose another job, what would you like to do? I would like to be a professional footballer or the GM of either an NHL team or major European football club. 9) If you were to become a sports journalist, how would you change the coverage of ice hockey in the UK press? Follow a team or players around for a week or so to give fans an insight to the day to day of players at and away from the rink. Something like the HBO 24/7 style. In today’s social media crazed world it’s tough to get real answers from players and coaches as any little thing can lead to social media backlash. Maybe one thing could be to ask less loaded questions to players and coaches. If they aren’t guided into how to answer the question you would get more interesting responses. 10) What’s the craziest thing you’ve ever done? I wanted to be a goaltender when I was really young. But my father steered me away from that choice and I’m glad he did! Not too many 5’9 professional goaltenders out there. 12) What will you do after you’ve finished this interview?